Today LiUNA took over Living Wage Wednesday and ignited a spark that will spread throughout this city and state. 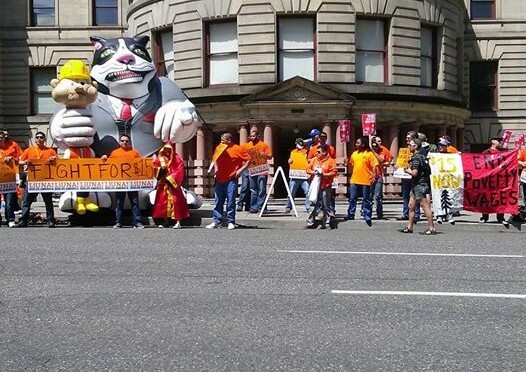 Around 75 Laborers and Portland citizens marched to City Hall and held a grand spectacle of a rally. A giant Fat Cat with his claws clasped tightly around a worker’s neck waved to honking motorists as the crowd chanted “15 NOW! 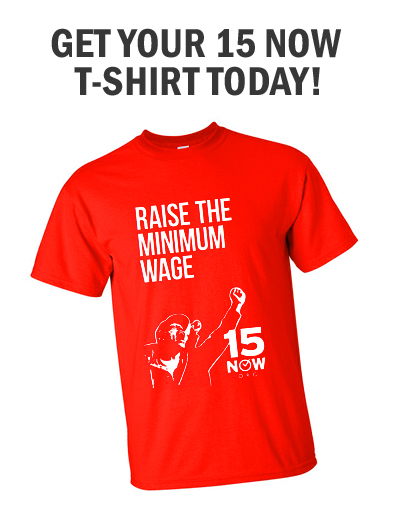 15 NOW!” At one point the Big Bad Corporate Boss showed up, and LiUNA’s champion for $15 came to the rescue, boxing it out with and knocking out the Corporate Boss, who gets rich by paying his workers poverty wages. After the Big Bad Corporate Boss was subdued, the rally continued on the steps of Portland City Hall with a great line up speakers. 15 Now PDX organizer Justin Norton-Kertson spoke about the growing income inequality in Oregon, and the need for people return to their towns and neighborhoods and organize, not just within union shops, but among neighbors and communities, and among all the non-unionized low wage workers such as fast food workers. Zack Carver from the Laborer’s Union spoke about the need for organized labor to come together behind the Fight for $15. Heidi Sirpress is a single mother, a minimum wage worker, and a member of the Portland International Socialist Organization. She spoke about the broken and dysfunctional nature of the global capitalist system, as well as about her experience struggling to raise a child and put herself through school on a minimum wage job. Next Jaime Partridge, a retired member of the Oregon State Association of Letter Carriers, read the resolution they just passed in endorsement of the Fight for $15 in Portland and the state of Oregon. Anne McDonnell, a zoo worker with LiUNA Local 483here in Portland, also spoke, and announced to the rally that their union just made the demand a $15 minimum wage for their workers at the bargaining table! Finally, Nicholas Caleb ended the line up of speakers by talking about what his run for city council accomplished, including the formation of 15 Now PDX, and he encouraged the city to continue to Fight for $15. After the speakers concluded, the rally moved inside City Hall with letters to deliver to each of the council member and the mayor. Security tried to allow only 5 people to enter the building and deliver the letters, but the ralliers demanded entrance to their public institution and access to their political representatives. Much to the dismay of City Hall security, the whole group was able to get inside. The group headed up to the second floor and proceeded to each of the council members’ offices, where Alexandra Meyer spoke on behalf of the group and delivered the letters. All of the letters were delivered the council members’ office staff. Dan Saltzman was the only council member who was in his office at the time. He came out and spoke with us, accepted the letter, and said he agreed that we need to raise the minimum wage in Portland. While we appreciate him coming out and speaking with us, he unfortunately did not and has not yet committed to $15 for the City of Portland. After the letters were delivered the rally made its way back downstairs and concluded with a call to continue the Fight for $15. 15 Now PDX is excited to continue teaming up with unions and workers around the city to hold great events like this. But Big Business and the Big Bad Corporate Boss are not going to let us have $15/hr without throwing millions of dollars into the fight against us. Help us fight Big Business and keep the pressure on our city council by making a contribution to the Fight for $15 in Portland today!